Monster Crunch! 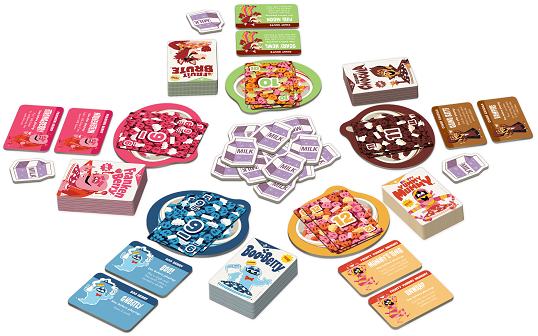 is a ladder-climbing, trick taking game for 2-5 players, ages 9 and up. Monster Crunch! is published by Big G Creative. Listen to our SNAP review of Monster Crunch! in under 5 minutes, or read about it below. To start, players choose which classic cereal character they want to be. They take their matching deck of cards, cereal bowl, player power boards, and a milk token, draw 12 cards from their deck, and the player who most recently ate a bowl cereal goes first. The goal of Monster Crunch! is to eat the most cereal. This happens over three hands. Each hand is a race to play all of your cards into your own cereal bowl before another player goes out. When a player goes out, any cards left in any other player’s hands are discarded and not scored at the end of the game. The first player starts by playing a low card (1 or a 2 for example). As this is a ladder game, subsequent cards played must be equal or greater than the last one. If a player can’t play a card or choose not to they pass for the round. Once all players have passed, if nobody has played all of their cards a new round is started with the remaining cards. That’s one hand. You’ll continue like that for two more hands and then the game ends. Then players total the number cards that have been played to their bowls. The player who has the most points wins. If you ever pass during a round you get a milk token, unless you were the last player to pass. When playing cards you can use the milk token to play two or more cards instead of one so you can keep climbing the ladder and get rid of cards faster. For example, if the card down is a 12, and you can’t play higher than that, you can use a milk token to combine two number 6 cards (or higher) to continue the round. Can you eat cereal faster than the other monsters? Player powers are another thing entirely. 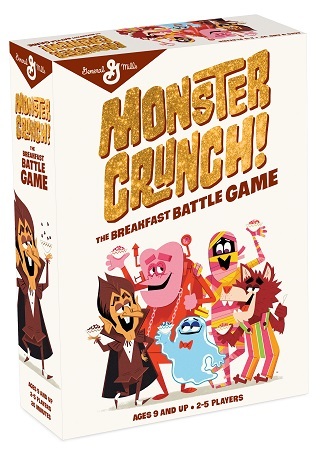 Each different cereal characters has their own one-time-use powers that change the game, like making the numbers go down instead of up or drawing extra cards. I liked that i can choose a monster to play. And I also think player powers are cool – they help you get extra milk tokens, and draw cards. And I really like the like the artwork. Monster Crunch! is no doubt aimed at kids and folks looking for nostalgia, who have fond memories of chomping on BOO Berry while watching Saturday morning cartoons. I loved how they merged the theme along with the gameplay. It captured the nostalgia while being a great ladder climbing game at the same time. The milk tokens and player powers are really needed here to make the game an engaging experience. Either way, Monster Crunch! is best served as a filler game or palate cleanser for the gamer group. Monster Crunch! is definitely based on classic 52-card deck games, which isn’t my favorite, and I usually I prefer heavier games. That being said, if Izzy asked me to play I wouldn’t turn down the chance. One thing I will say this game is perfect for is gifting. At $20 and available widely at Target, you can’t beat it. We give Monster Crunch! a four stars out of five, because its a good kids game. For you kids out there you gotta play this game. The Family Gamers were provided a sample copy of Monster Crunch! for this review.